Carrier Ethernet and Business Cable Broadband both offer high speed bandwidth service at reasonable prices for the small to medium size business. No need to let bandwidth limitations stifle your business. Here are two affordable options to acquire 100 Mbps Fast Ethernet service, likely as much as a small to medium size operation will need. I’ll tell you later how to upgrade that to Gigabit Ethernet when the time is right. The gold standard in business bandwidth has shifted from legacy T1 lines to fiber optic service. Not the old expensive SONET telco fiber that you know as OC-3, OC-12 or OC-48. I’m talking about the modern Carrier Ethernet standard known as Ethernet over Fiber, also called Metro Ethernet. Entry level fiber service typically starts at 10 Mbps. That’s enough for many small businesses with limited Internet or file transfer needs. With even a few employees or heavy use of cloud applications, you’ll be craving more performance. That’s where Fast Ethernet shines. It offers 100 Mbps x 100 Mbps dedicated bandwidth 100% of the time. Performance is much like your old T1 line or DS3 connection, but much faster. Symmetrical bandwidth means that your upload and download speeds are both 100 Mbps. That’s important if you run cloud applications that send large files in both directions. Backup to cloud storage is almost exclusively in the upload direction until you need to recover a file. Fiber optic bandwidth is known for low latency, packet loss and jitter. Your service will be solid since all of the line bandwidth is dedicated to your business. Whatever capacity you aren’t using at the moment sits idle, much like the way a Local Area Network behaves. That brings up another important advantage of Fast Ethernet over Fiber. It is directly compatible with your LAN. Just plug it in to your router or switch and it’s ready to use. Many business networks run at 100 Mbps, although new installations are typically 1000 Mbps and larger networks are 10,000 Mbps or 10 GigE. Business Cable Broadband has come a long way over the years. Most systems are HFC or Hybrid Fiber Cable. That architecture employs a private fiber optic network for the long haul runs. Traditional 75 ohm coaxial copper cable connects from the curb to your building. The termination equipment is a DOCSIS modem. Most are DOCSIS 3.0, which easily provides 100 Mbps Internet service up to a maximum of 1.2 Gbps in the download direction. The newer standard is DOCSIS 3.1, which easily provides Gigabit Internet service with a growth path to as high as 10 Gbps in both directions. Two advantages of Cable broadband are availability and cost. You can get service if the cable runs past your building, and that’s most buildings in metro areas. The cost for 100 Mbps Fast Ethernet is likely a fraction of what you pay for Ethernet over Fiber. Construction costs are minimal, if at all. Simply plug your network into the Ethernet connector on the DOCSIS modem. The cost difference is reflected in a difference in service level, although that may not make a difference depending on how you use the service. Cable bandwidth is shared, not dedicated, which can mean variations in line speed that depend on how many other users are online and how heavily they are using the service. The bandwidth is asymmetrical, meaning that download is much faster than upload. A typical bandwidth service is 100 Mbps down and 10 Mbps to 25 Mbps up. Typically Internet usage is heavily in the download direction for web browsing and watching video. Email is both upload and download, but the files tend to be fairly small and not affected by the asymmetry. If you send to large mailing lists to deliver video from your own servers, the upload bandwidth could become a limitation. One advantage that both fiber and cable service share is that they are easily scalable compared to the old T-Carrier and SONET telco standards. You simply need a port that can handle the maximum bandwidth you anticipate needing. For fiber, that’s a Gigabit Ethernet port on the Customer Premises Equipment. For cable it’s a DOCSIS 3.0 or 3.1 modem. With those in place, you can upgrade your speed with just a phone call and no equipment changes will be necessary. Do you feel limited by your current point to point or Internet access speed? You may be surprised how affordable a major upgrade is. 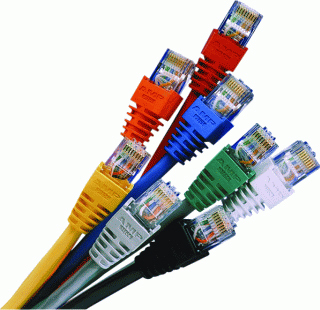 Check out Fast Ethernet service options for your business now.